Bribery Act (2010) - don't get caught out..
« Agency Workers Regulations: your agency staff and the law.. Bribery Act (2010) – don’t get caught out! 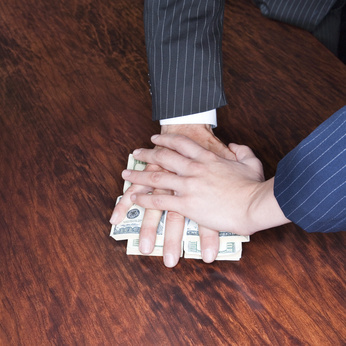 The provisions of the Bribery Act (2010) may well affect your business. Bribing – the offering, promising or giving of an advantage. Being bribed – requesting, agreeing to receive or accepting an advantage. The “corporate offence” where a commercial organisation fails to prevent persons performing services on its behalf from committing bribery. The “corporate offence” is one which employers must be aware of . The company will be guilty of this offence if an employee who performs services on its behalf bribes another person, intending either to obtain /retain business for the company, or to obtain /retain some advantage in the the company’s business conduct. If a company is prosecuted and found guilty of corporate bribery, the company (and its Directors) will be subject to significant fines under criminal law. The Act does contains a defence under which the company can minimise or escape liability for corporate bribery if it can show that it had in place “adequate procedures” designed to prevent those persons performing services on its behalf from committing bribery. Proportionate procedures – An organisation should put procedures in place proportionate to the bribery risks that are faced dependant on the nature of the organisation. The procedures should be clear, practical, accessible, effectively implemented and enforced. Top level commitment – Top management must be committed to preventing bribery through both their actions and effective communications. Risk assessment – The organisation should regularly assess its exposure to potential external and internal risks of bribery. Due diligence – There must be effective procedures in place that take a proportionate and risk based approach in respect of those involved in the organisation or carrying services out on behalf of the organisation. Monitoring and review – As the business changes over time, there should be an ongoing monitoring process of all bribery procedures and action taken to update these as appropriate. Carry out a risk assessment of the chances of bribery occurring in your organisation. If this is minimal then a proportionate response would be that you do not need to put specific bribery prevention procedures in place. Allocate responsibility for anti-bribery activities to a Director / senior manager. This could be the head of finance (or nearest equivalent) who would also ensure that financial procedures were adequately reviewed. Implement an appropriate policy which outlines expected standards of conduct in relation to bribery, and which clearly defines the behaviour as gross misconduct. An example policy here.. Amend your Contract of Employment to incorporate a paragraph referring to bribery and its implications as gross misconduct. Updated contract here.. Amend your Disciplinary Procedure to refer to bribery as an example of gross misconduct. Template policy here.. Ensure you have a Whistleblowing Policy in place. Template policy here.. The Ministry of Justice guidance can be found here..